KBS’ vague criteria for reviewing K-Pop has become the center of scrutiny. KBS released its review results on its homepage on the 28th of September and was immediately swept up in controversy when it was found that JYJ’s ‘Mission’ and ‘Pierrot’ were banned for reasons of ‘personal attacks in lyrics’. 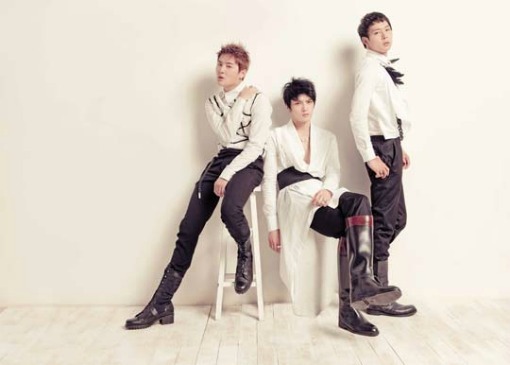 JYJ’s new song Pierrot has received the decision of being unfit to be aired from KBS. JYJ plans to submit an explanatory document claiming that the decision is unfair and to request a re-deliberation. KBS recently laid the decision that the song Pierrot is unfit to be aired. The reason as presented by KBS is that it is “a personal attack against an individual.” It argues that the term p.s.m. in the lyrics mean “president Lee Suman” and that this holds a personal grudge toward a specific individual. Therefore, JYJ plans to submit a document explaining the environment behind the lyrics in question and to request a new deliberations. Even without appearance on TV programs, group JYJ (Jaejoong, Yoochun, Junsu) swept all online charts, which proves their popularity. Therefore, fans are focusing on whether they can appear on music programs. 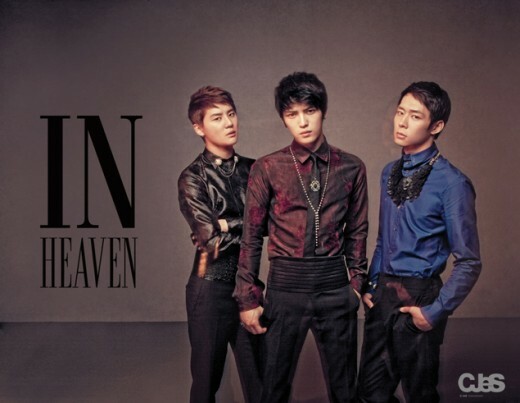 According to Olleh Music on the 16th, [In Heaven], JYJ’s first Korean album consisting of songs revealed during their world tour, won Social Charts for 2 weeks by taking #1, #2 and #3 with its main songs. But unlike other artists who released new song at the same time, JYJ didn’t appear on any music program, which makes this achievement even more meaningful. Also, the album will be officially released on the 27th, yet its preorder sales reached 300,000 and it’s temporarily out of stock at all online purchasing sites. The orders are pouring in so much from Japan, China and all over Asia that the supply and demand is put on emergency alert. However, JYJ is still in the situation where they can’t be seen on any music program. JYJ’s title track ‘Get out’ has already reached the public through LG Electronics’ advertising and they are planning to open a video community as official channel to communicate with global fans. Also, they are preparing a charity project for underprivileged and neglected people that they had chance to meet as Goodwill Ambassador in 2011. JYJ Performance Cancellation: When will KBS’s disgrace of the 7 World Wonders be addressed? 110717 “JYJ Performance Cancellation” When will KBS’s disgrace of the 7 World Wonders be addressed? The impact of the unilateral cancellation of JYJ’s performance by KBS Jeju and Jeju island is growing larger. 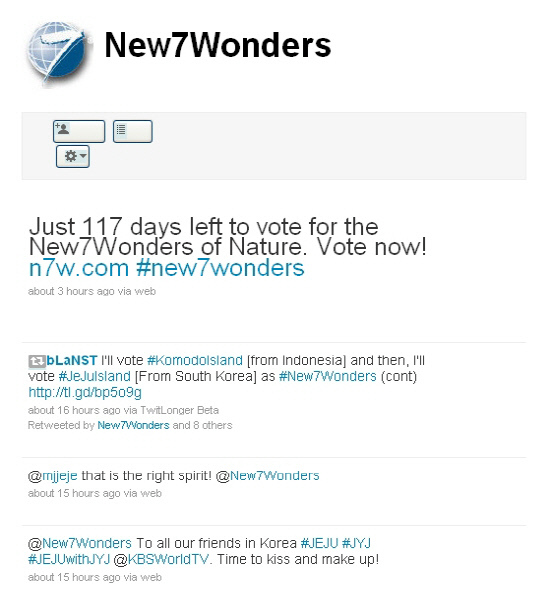 On July 17th, The 7 World Wonders project, lead by the New7Wonders Foundation, sent a tweet on their official twitter to KBS stating “To all our friends in Korea, time to kiss and make up!” in regards to the protests. KBS’s controversial unilateral cancellation notice towards JYJ prompted Kim Jaejoong to tweet “If there are obstacles in prompting our own country’s natural scenery, then under these conditions I will have to promote it by myself” as well as changing his profile photo to a picture of Jeju’s landscape, causing much praise for his actions. Last May the Jeju Provincial Government and the New7Wonders Foundation appointed JYJ to be Honorary Ambassadors for Jeju in the 7 World Wonders campaign. JYJ were to appear on July 20th as part of the KBS Jeju Special Broadcast Concert. 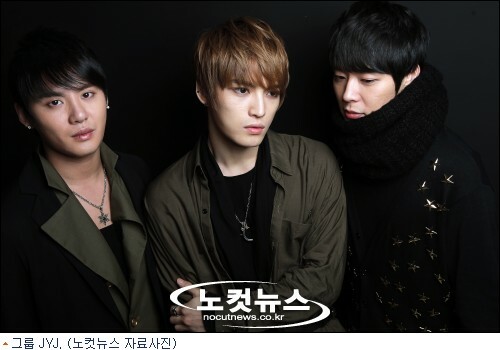 But on the 16th, four days before the show, KBS issued a notice of cancellation to JYJ. There was not a clear reason stated, but it was also announced that SNSD and f(x) would be making an appearance. A representative of KBS Jeju stated “In our final stages of our broadcast preparation, our plans for SNSD and f(x)’s appearances became possible and we have expressed out greatest apologies to JYJ’s representatives”. However Cjes, who is in charge of JYJ’s management, have said “we have yet to receive an apology”, leading to a second controversy. JYJ’s side has released an official statement in response to the explanation released by KBS on why the group has been unable to appear on ‘Music Bank’. KBS is being scorned by the public for resorting to evasion of responsibility after deleting their official position on the restrictions against JYJ’s televised appearances on its variety programs once the statement was surrounded by controversy. On the 19th, KBS deleted its official statement on the reason why JYJ (Kim Jaejoong, Park Yoochun, Kim Junsu) are unable to appear on KBS variety programs such as ‘Music Bank’, which was posted on the ‘Viewers’ Thread’ and answered by the staff of the variety program sector. However, KBS is breeding doubt by failing to post an official reply as to why the post was deleted. But as the ‘Response from the Staff’ in question was moderated by the Viewers’ Thread staff, this shows that they have done nothing but evade their responsibilities. This means that the KBS Viewers’ Thread staff have deleted a controversial post without even giving a reason why. We would like to question if ‘buck-passing’ is the best course of action for the KBS Viewers’ Thread at this moment. Can the promise between KBS and JYJ be kept? 110520 Can The Promise Between KBS And JYJ Be Kept? The ironic situation of Park Yoochun being unable to appear on MBC variety programs despite participating in the filming of MBC drama ‘Goodbye Miss Ripley’, the scandals arising from KBS rejecting JYJ’s appearance on Music Bank, among the Korean celebrities, nobody is more debated than JYJ. None of the music programmes allow JYJ to stand on the stage. Even if they insist that there are no restrictions whatsoever, there are still no programmes found that allow JYJ to participate in the broadcast. There is no direct evidence that can show that SM Entertainment, JYJ’s previous management company, pressurised broadcasting companies. However, it is the reality that no broadcasting company is willing to let JYJ, the group situated in the center of the controversy, stand on stage. YJ is rated as the new model of idol celebrities. Unlike other celebrities who place their looks above all, JYJ puts their singing abilities as the basis, having equal improvement and development in both performing and singing aspects. Also, each member’s musical talent is equally outstanding, with their composing and lyric-writing abilities being showcased, and JYJ Kim Jaejoong was even the concert director of their world tour, exceeding beyond idol singers to be true artists. Additionally, Kim Junsu’s recent version of ‘That Man’ received a huge amount of attention, despite the background music being different from original singers Baek Ji Young and from drama ‘Secret Garden’ ‘s Hyun Bin, Kim Junsu’s unique voice stood out. Even so, we are still unable to see these singers, who are acknowledged as one of those with the best vocal ability among idol celebrities, appear on music programmes. This can only be seen as the audience’s loss. What the audience hopes for, is for JYJ to be able to appear on the music programmes, to at least give them a chance to compete. To this, JYJ already has a chance to get rid of the broadcast restrictions place on them. 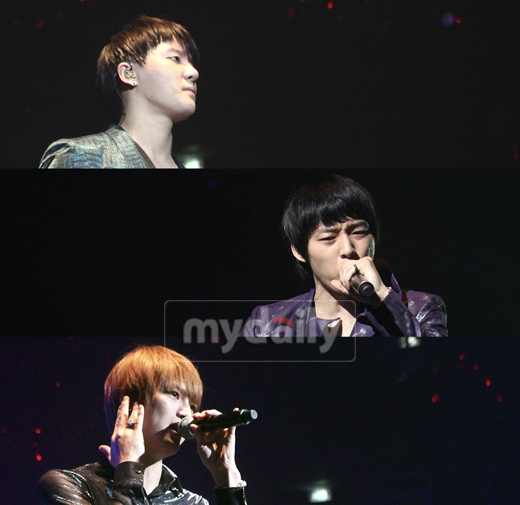 Recently, JYJ began their North American tour, bringing 4 new songs, and they will also wrap up the world tour in Busan in June. If JYJ releases an album with the new songs then, KBS will have to do like what they said, following the programme regulations and allowing JYJ to appear on the broadcast. It is difficult to tell if JYJ, who left their previous entertainment company, is successful or not based on the current restriction on their activities. It is definitely not right to judge them as failing before giving them even one chance to perform. If JYJ’s musical ability is lacking, there will not be any need for a restriction on their activities. The audience’s unwillingness to listen to them will be the biggest condemnation. This is why the right for the public to judge JYJ’s songs cannot be snatched away. Additionally, what KBS mentioned about the risk of adversely affecting the cultural industry, is not because of JYJ’s broadcast appearance, but due to the unfairness of the chances (to appear on the broadcast). This point should always be remembered.